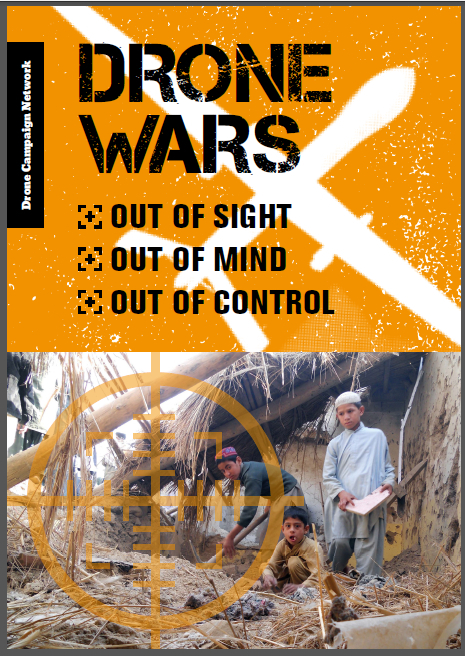 A Freedom of Information request by Drone Wars UK has revealed that only 5% of British air strikes in Iraq and Syria are pre-planned. According to the FoI reponse from the Ministry of Defence out of 414 UK air strikes in Iraq and Syria during 2015, 395 were launched under dynamic targeting procedures while just 19 were pre-planned. Dynamic targeting procedures are used when aircraft are already in the air and either ‘targets of opportunity’ are spotted or strikes are launched in defence of troops on the ground during direct combat. The Ministry of Defence continues to insist that there is no evidence that any of the UK’s 845 air strikes launched since September 2014 in Iraq and Syria have killed or injured civilians. Casualty reporting organisations however report that hundreds of civilians have been killed in Coalition air strikes. Airwars, which tracks strikes in Iraq and Syria reported this week that more than 1,300 civilians have been killed in Coalition air strikes. 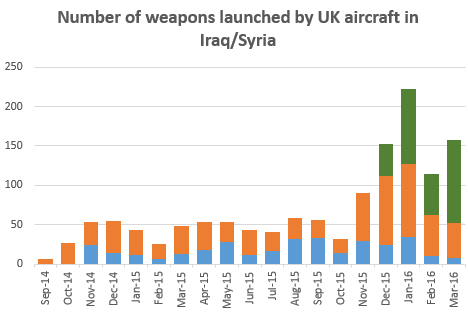 However our analysis of UK strikes in Iraq and Syria (from the MoD’s regular updates) show that many of the strikes cannot be classified as close air support strikes. An important investigation published in last week’s Washington Post illustrates clearly how dynamic strikes can kill civilians without those undertaking such strikes being aware of the impact on the ground. On 13 March 2015 US aircraft were sent to strike an Islamic checkpoint near Mosul, a dynamic targeting mission, according to a subsequent Centcom report. The pilots later report that the guard shack was flattened, two vehicles destroyed and four enemy fighters killed. Two weeks later however an email arrived at the US embassy from Raja’a Zidan al-Ekabee, an Iraqi woman who owned one of the cars, reporting civilian casualties and requesting compensation for her destroyed car. She had fled Mosul earlier and was paying a driver to undertake the dangerous job of bringing the car out of the area. Apparently the driver brought fleeing civilians along in the car which was travelling with a second car also filled with escaping civilians. However the four civilian casualties accepted by the US under counts the actual number of civilian deaths. According to the Washington Post, which interviewed surviving family members (including a lieutenant colonel with the Iraqi police) and local officials, eleven civilians actually died in the strike, including five children, four women and two male civilian drivers. It should be noted that no compensation was paid to Ekabee. An email from the US military stated that she was not entitled to compensation as the car was destroyed in “combat activity.” Separately, family members of the civilian victims did not as yet claim compensation. Here in the UK, the bullish tone around the precision of UK air strikes and the lack of civilian casualties from UK strikes appears to be being modified. In his latest quarterly statement to parliament on the campaign, Defence Secretary Michael Fallon argued that while the UK takes “very good care” to minimise civilian casualties, “in the messiness of war it is not impossible that there may be civilian casualties at some point”. Later in response to questions, he accepted that “it will be more and more difficult to ensure that we avoid civilian casualties” in areas of intense fighting, a reference no doubt to the coming heavy strikes on Mosul and Raqqa. 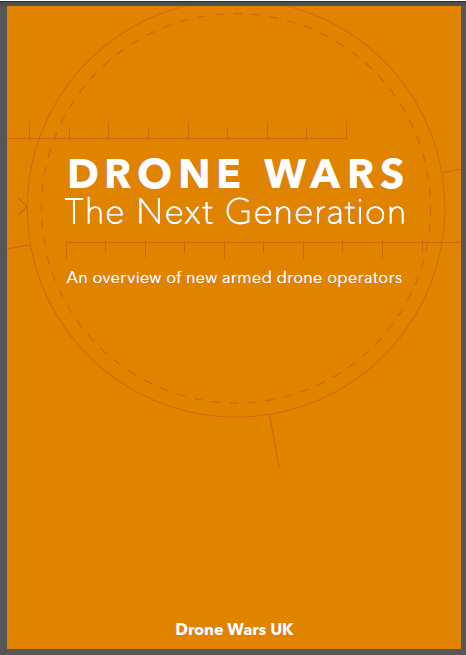 While some will accept such casualties as the price ‘we’ (sic) have to pay to tackle ISIS, a brief read through the hundreds of individual human stories of those killed in Coalition airstrikes compiled by Airwars should give all serious pause for thought.